When I was a child, I use to enter the County Fair. One of the categories I would enter in was Table Setting. I remember practicing my table at home and my mother telling me that I had my forks and knives backwards. I proceeded to be the precocious little girl I was sometimes and told her it was my vision and this is how I liked. Needless to say, the judges did not agree with me. 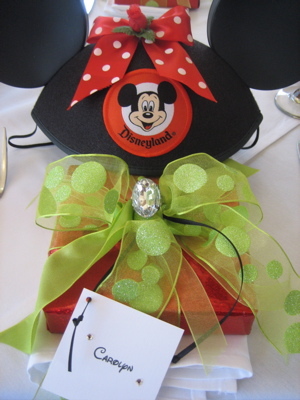 Table Setting can be fun and can tie everything together. This is also something that can be done in advance. Napkins on the Left and Left of the Fork or can be in the center where the plate will go. Spoons are to the right of knives the right right of the knives. Dessert Spoon and Fork can be placed above the Plate. The Spoon facing left and the Fork facing right. 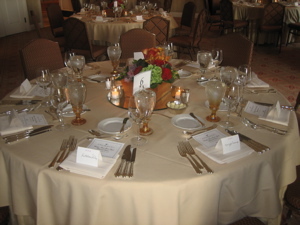 Place Cards – are either on the napkin if it is in the center or above the place plate. So, what if your guests don’t get it. At my orphan’s Thanksgiving last year, I had people eat their salads on their dinner plate. But I put dessert forks on the table, closest to the plate. Then when dessert time came, I noticed most of the dessert forks were used, and I didn’t have any clean ones. We ended up using spoons, but is there a way to politely educate guests about this, or should I just prepare for these little snafus in advance by getting more forks? Love your website, btw, you are an inspiration!